Is this a peaceful exercise of the 1st amendment or a gross abuse of the 2nd amendment? “The crowd protesting Saturday recited the pledge of allegiance, and many offered prayers. Others waved placards reading, “This land is your land,” and “We teach our children not to bully. How do we teach our government not to be big bullies?” according to ABC News. Let me get this straight, you wield weapons, intimidating and threatening the lives of federal agents carrying out their sworn duties, and you say THIS is a lesson for your kids on how NOT to bully, as you (the parent) epitomize and define the very essence of bullying in your protest. And THEN YOU are going to suggest that this was a peaceful first amendment protest? How do you reconcile the freedom of speech and to assemble protected in the first amendment, with bringing mass numbers of semi automatic weapons to the protest? Can the two coexist at one event? Or wouldn’t it be true that as a protester you are threatening the sacredness of the first amendment by combining it with your second amendment? Is it really a peaceful assembly at that point? I don’t think so. And when you are there NOT for the set purpose of protesting, BUT RATHER, the purpose of preventing the government from carrying out their sworn duties? That’s-well-illegal. The right to free assembly and freedom of speech does not in ANY way, give Americans the right to “obstruct justice” or interfere with an ongoinig investigation. When we do, we are subject to arrest and jail time. Period. And when a Republican governor has this to say, it is a sad commentary on his unwillingness to denounce the illegal and gross misconduct taken by his Nevada citizens: “The safety of all individuals involved in this matter has been my highest priority. Given the circumstances, today’s outcome is the best we could have hoped for. I appreciate that the Department of the Interior and the BLM were willing to listen to the concerns of the people of Nevada.” Really? He says that as if “the people of Nevada” had been in diplomatic discussions all day in a meeting with coffee and donuts. But that’s not true. 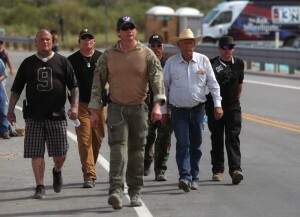 The “Nevada people” were out brandishing their weapons, breaking the law-obstructing justice. Not to mention, making blatant and flagrant claims that they were willing to use those weapons against innocent employees of the government if they didn’t get their way. Well, get their way they DID. Furthermore, ZERO admonishing on the part of Governor Sandoval for his state’s citizens to go home and leave the federal agents to do their job was forthcoming. In this country we have an adversarial system. It’s named, in short and in simple terms, the American legal process. What that means, is if you are an American citizen you always have a way to appeal decisions by the government, a right that is unheard of in many many countries around the world. Mr. Bundy and his militia friends have chosen not to pursue this legal course of action that is available to them and what has been used successfully for hundreds of years to impact and change multiple political and social issues. Instead, they have chosen to stage a coup more or less and overthrow the Bureau of Land management. Was there a moral basis for this act of violence and rebellion? Had the BLM been threatening lives of citizens? No. Had they been accepting bribes and practicing open corruption? Not by any reports or accounts! Were they doing ANYTHING that might demand such interference and bullying on the part of concerned citizens? No, they were just carrying out their sworn duties under the umbrella of the same adversarial system that grants the defendant the right of appeal. No indeed. The federal government first ordered Cliven Bundy to remove his cattle in 1998. They have made repeated efforts, seeking his legal and peaceful compliance with the law for over 16 long years! 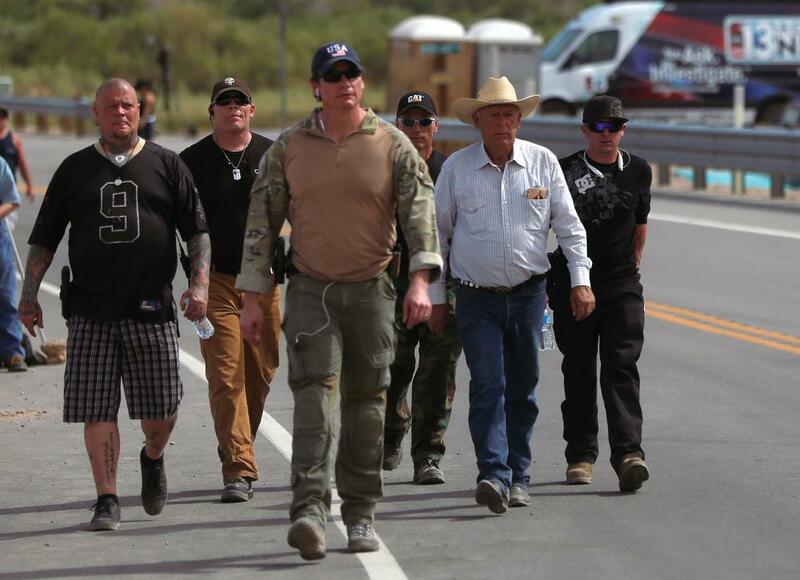 But apparently, unlike other ranchers in the area, Cliven Bundy is above the law. “This is a matter of fairness and equity, and we remain disappointed that Cliven Bundy continues to not comply with the same laws that 16,000 public-lands ranchers do every year. After 20 years and multiple court orders to remove the trespass cattle, Mr. Bundy owes the American taxpayers in excess of $1 million. The BLM will continue to work to resolve the matter administratively and judicially,” BLM Chief Kornze. I think Governor Sandoval is an embarrassment to the Republican party as much as Vance McAllister and his staffer affair could ever hope to be. When a governor (as well as state congressmen) give their blessing to the grossly inappropriate actions of red neck bullies, (think two year olds with weapons) it’s embarrassing to his political party. This whole event and public display of insolence should be embarrassing and mortifying to all of us as citizens. If you are a Christian, it should be equally mortifying every time one of the militia men recites a prayer! Previous PostLose the Fish!Next PostWhat breaks your heart? Well, who else can do this? If Cliven can get the wink wink from the governor to stand down federal agents with a stinking militia, the former of who are clearly in the process of serving legal search and seizure warrants, who else can do this? Drug dealers? I’m not sure Governor Standoval is ready for that onslaught.